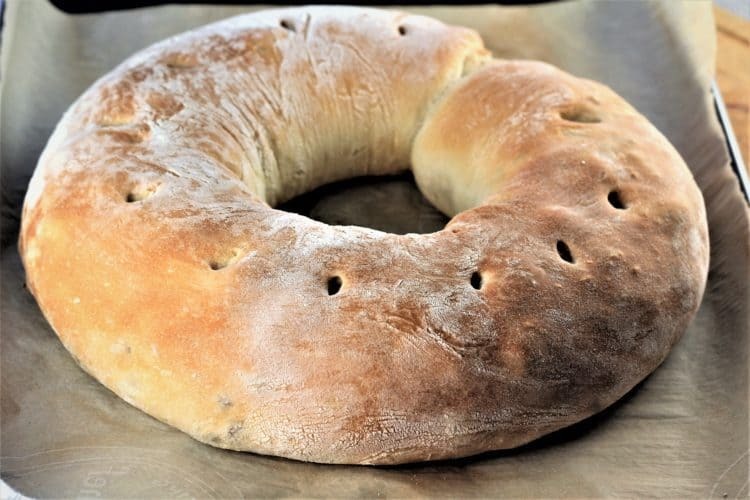 Sicilian Sausage Bread or Bignolati is typical of the Agrigento region of Sicily. 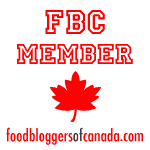 This savoury bread is a great appetizer for a holiday gathering and makes a stunning presentation! 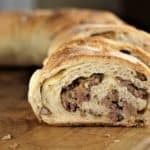 I have long heard of this Sicilian Sausage Bread or Bignolati as the Sicilians in Montreal originating from the province of Agrigento refer to it. My mother has never made bignolati. The closest thing she makes are little buns filled with black olives and cheese. Once again, this goes to show how Sicilian cooking varies from one province to another within the island. This is actually my first attempt at making this recipe. I was expertly guided by my dear friend Maria from Imparate cooking school (where I teach as well). It was she who first told me of this beautiful shaped version of bignolati as prepared by her nonna. I presented her with a sample and she gave me the thumbs up! 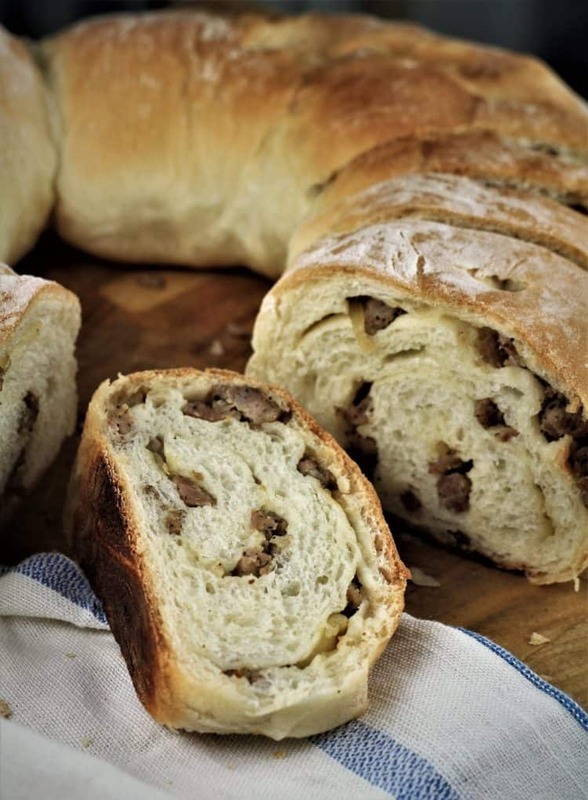 Sicilian Sausage Bread is served on Christmas Eve, New Year’s Eve or other special occasions. I decided to share the recipe with you just in time for New Year’s Eve! 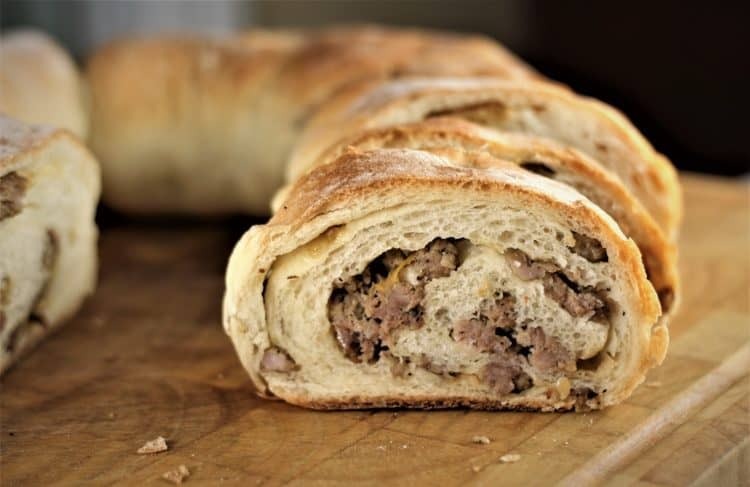 Watch my video on how to make Sicilian Sausage Bread! 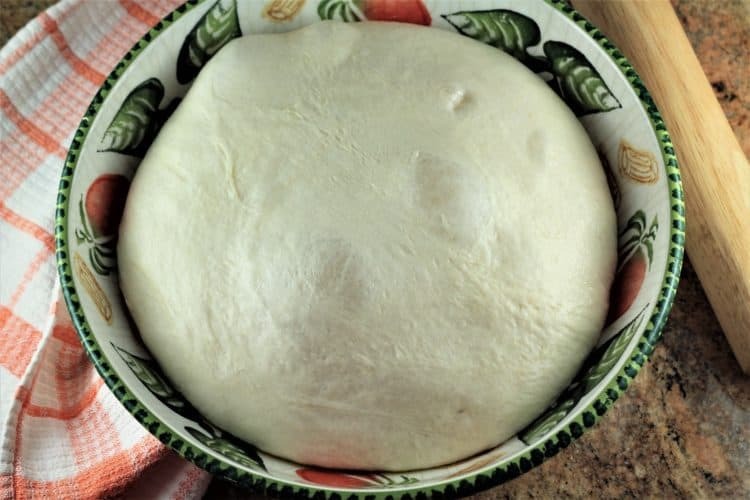 The first step is to prepare a basic pizza dough. This is the same dough recipe I previously shared in my Pizza Party post. For this recipe, I made half the amount of dough. In a large bowl or the bowl of your stand mixer, combine warm water and yeast. Let stand about 10 minutes. Add olive oil, salt, sugar and flour. Mix by hand until a dough is formed. Knead for about 10 minutes until the dough is smooth and elastic. If using a stand mixer, use the dough hook to mix the ingredients on low speed for 1 minute. Increase to medium speed and kneed for 7 minutes. Transfer dough to a large bowl lightly coated with olive oil and turn it once to coat with oil. Cover with plastic wrap and let rise in a warm place until doubled in bulk, about 2 hours. While the dough is rising, prepare your filling. In a large skillet on medium heat, sauté thinly sliced onions until golden, about 10 minutes. Transfer to a bowl and let cool. In the same skillet, brown mild Italian sausage without the casing until no longer pink. Transfer to a bowl and let cool. Once the dough has risen, transfer it to a well floured counter top. 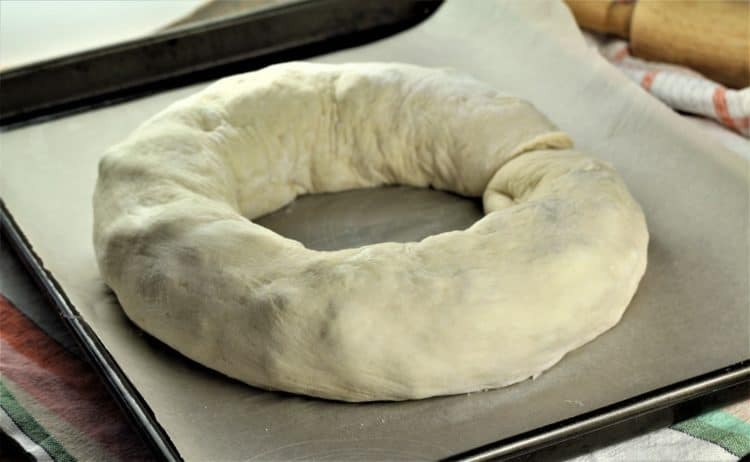 Begin flattening the dough using the tips of your fingers to stretch it out. 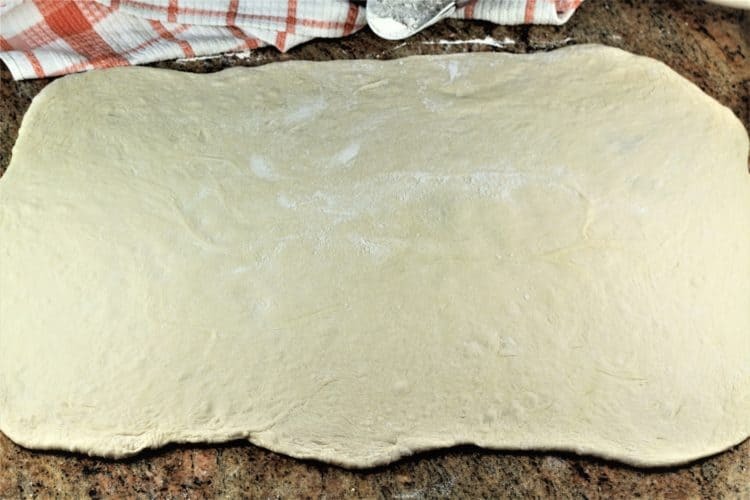 Next, use a rolling pin to roll out the dough into a large rectangle, as shown. Evenly spread out the onion on the dough, followed by the sausage. Roll the dough in a jelly roll fashion beginning with the long end closest to you. Once rolled, I cut off about 2 inches of loose dough on each end shaped the excess dough into a small bun. Transfer the rolled dough onto a parchment paper covered baking sheet. Connect both ends together to form a circle. Cut a few slits on the top and let sit, covered, for 1 hour. And look how beautifully it puffs up! Bake for 15 minutes at 400F, then reduce oven to 350F and bake for 20-25 minutes until golden. Let cool about 15 minutes before cutting into individual pieces. Try spicy Italian sausage instead of mild for some extra kick. You can double the amount of sausage if you’re feeding a particularly meat loving crowd. Make a vegetarian version with black olives and cheese; spinach and ricotta; or use your imagination and choose your own filling! If you’re short on time, purchase a prepared pizza dough from your local Italian bakery and you’ll have bignolati ready in no time! 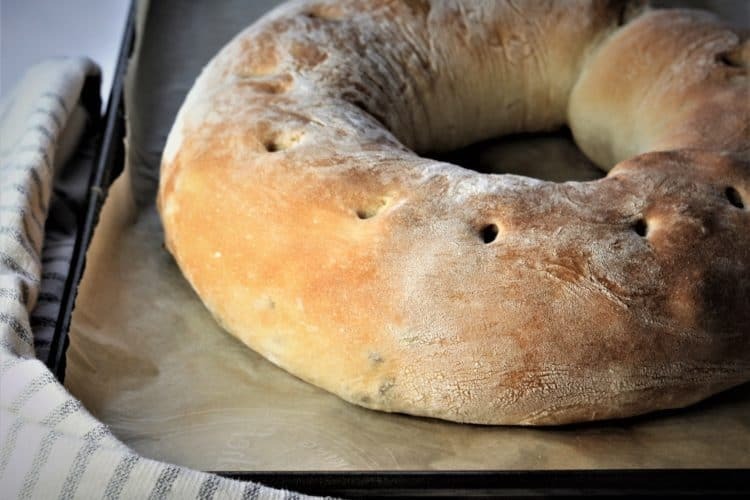 Sicilian Sausage Bread can be frozen after baked. Simply cut into wedges, seal in an airtight bag or plastic wrap and freeze. Defrost in the oven. 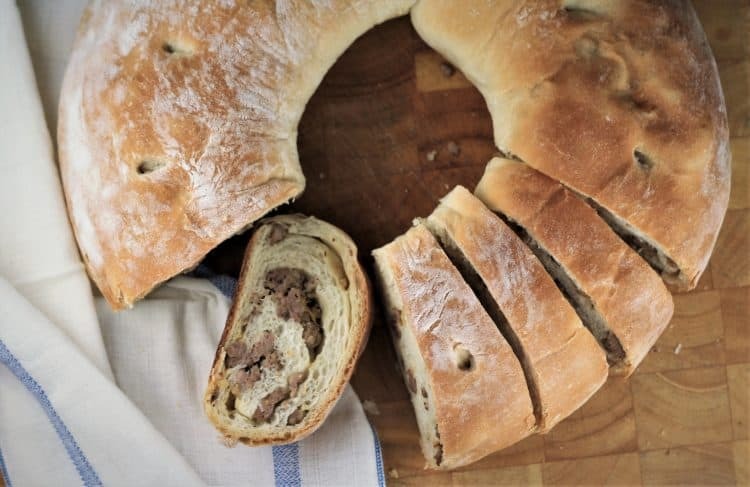 You’re still in time to prepare some Sicilian Sausage Bread for your New Year’s Eve feast! If you do, don’t forget to tag me with @mangiabedda or #mangiabedda on Instagram and Facebook, and feel free to share this recipe with your friends on social media! Until next year, my dear readers I wish you all Buon Anno! 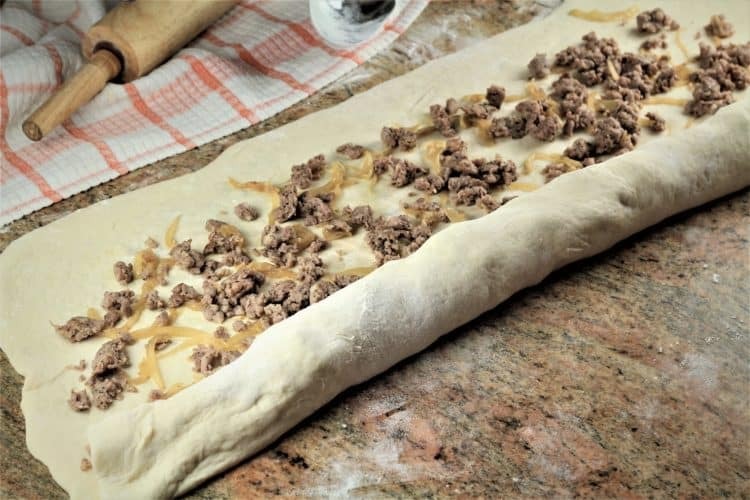 Sicilian Sausage Bread or Bignolati is originally from the province of Agrigento in Sicily. This bread is served on Christmas or New Year's Eve or other special occasions. In a large bowl or the bowl of your stand mixer, combine the warm water and yeast. Let stand about 10 minutes. Transfer dough to a large bowl lightly coated with olive oil and turn it once to coat both sides with oil. Cover with plastic wrap and let rise in a warm place until doubled in bulk, about 2 hours. 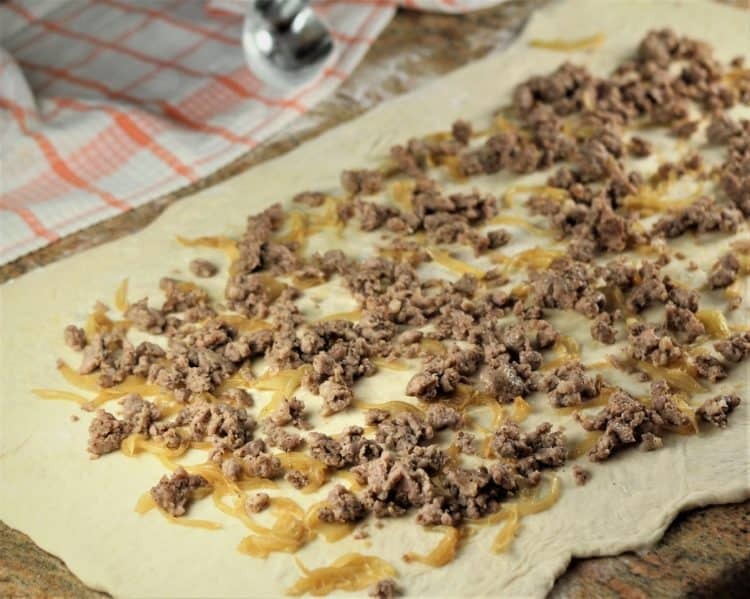 While the dough is rising, prepare onions and sausage. In a large skillet on medium heat, sauté the onions in olive oil until golden, about 10 minutes. Transfer to a bowl and let cool. In the same skillet, brown the sausage until no longer pink. Transfer to a bowl and let cool. Preheat oven to 400F and cover a baking sheet with parchment paper. Once the dough has risen, transfer it to a well floured counter top. 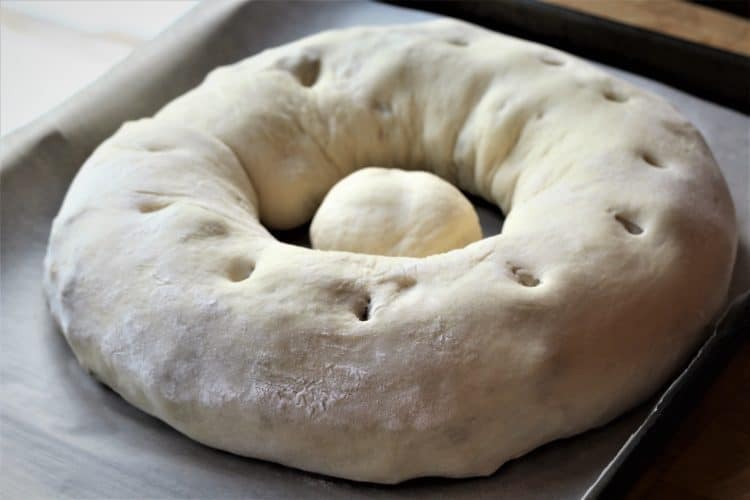 Begin flattening the dough using the tips of your fingers to stretch it out. Next, use a rolling pin to roll out the dough into approximately a 24'x 16' rectangle, as shown. Evenly spread out the onions on the dough, followed by the sausage. Roll the dough in a jelly roll fashion beginning with the long end closest to you. Once rolled, cut off excess loose dough on each end and shape into a small bun. Transfer the rolled dough on the parchment covered baking sheet. Connect both ends to form a circle. Cut a few slits on the top and let rest, covered, for 1 hour. Bake for 15 minutes, then reduce oven to 350F and bake for 20-25 minutes until golden. Let cool about 15 minutes before cutting into wedges. You can double the amount of sausage if you're feeding a particularly meat loving crowd. If you're short on time, purchase a prepared pizza dough from your local Italian bakery and you'll have bignolati ready in no time! Look so good. We do something like this on Easter Day, but it’s great any time of the year. Thanks Angie! I'm curious about yours, does it have eggs?